As soldiers marched to war in summer 1914, most of them expected to be back home within a few weeks and surely by Christmas. But instead, the fighting lingered on and the First World War was fought not just by soldiers on battlefields, but also by citizens at home. As part of the national commemorations of the centenary of the First World War, Amgueddfa Cymru is hosting a major series of exhibitions, events and community activities to explore the impact the First World War had on life in Wales. The programme will begin officially with the opening of Efforts and Ideals: Prints of the First World War at National Museum Cardiff on 2 August 2014 – a significant weekend marking 100 years since Britain declared war on Germany. The exhibition, which will be on display until 4 January 2015, will showcase the entire series of 66 lithographic prints from the portfolio, The Great War: Britain’s Efforts and Ideals commissioned by the British government in 1917. Designed in two sets of portfolios, “Ideals” and “Efforts”, the images were designed to encourage a war-wary public and raise support for the war effort. They show modern political propaganda in its early stages. The “Ideals” prints address the question of why Britain was at war and expresses the aims and ambitions of the war through use of allegory and symbolism. Historical or mythological figures are used to communicate broader ideas and concepts. The “Efforts” prints illustrate some of the activities of the war effort. Nine artists contributed to this section including renowned war artist, Christopher Nevinson’s famous set of prints, Making Aeroplanes. As images of propaganda, they purposely avoided showing the horrors and atrocities of war, as was typical of the work of the official war artists. For example, the Women’s Work portfolio records the vital contribution to the war effort made by women in munitions factories, but ignores the hardship, danger and monotony of the work. “Although many of the government files relating to this print series were lost in a fire, I have been able to piece together a lot of information to establish how much the artists were paid and where the prints were exhibited. 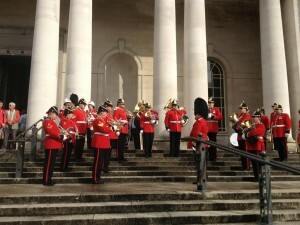 On Saturday, 2 August 2014, to mark the opening of the exhibition and the start of the Museum’s significant five year programme,the Regimental Band & Corps of Drums of The Royal Welsh (by kind permission of Lt. Col. R. Manuel, Commanding Officer, 3rd Battalion) will perform on the front steps of the building from 9.45am. This will be followed by free family activities throughout the day (10am – 5pm) including a history re-enactor, art workshops and music by a ‘pop up’ opera group. First World War themed stamps will also be on display, thanks to the Royal Mail and items relating to the War from St Fagans National History Museum. The exhibition forms part of Amgueddfa Cymru’s programme to commemorate the centenary of the First World War. Our Cymru’n Cofio Wales Remembers 1914 – 1918 programme and related activities are generously supported by Welsh Government (CyMAL), the Heritage Lottery Fund, the Armed Forces Community Covenant Fund and other donors. Thank you also to Chwarae Teg and the Royal Mail for supporting the launch and players of the People’s Postcode Lottery for supporting the Museum’s events and exhibitions programme. 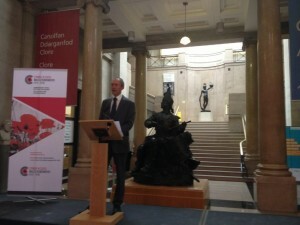 Admission to all Amgueddfa Cymru – National Museum sites, including National Museum Cardiff, is free, thanks to the support of the Welsh Government.